Sometime around 1000 AD, Europe experienced a revival of town life. This occurred under the feudal system and was encouraged by local noblemen. The majority of these new towns were built close to the nobleman's castle or manor house. At the same time, many towns were erected on the sites of former Roman cities. These towns were governed by local town councils. After some time the towns prospered from trade and collecting taxes and with the money they constructed bridges, roads, defensive walls, and cathedrals. As these towns grew and became cities they each wanted to distinguish themselves. At the time, the best way that they could accomplish this was by building an amazing cathedral. At first the cathedrals were built in the same fashion as earlier Greek and Roman temples. This style, which is called Romanesque, had thick stone walls, rounded arches, and narrow openings for light. In the 1200's, Romanesque architecture was replaced by Gothic architecture. One of the very first Gothic structures was the Church of St. Denis, which was constructed near Paris. It took ten years to complete. 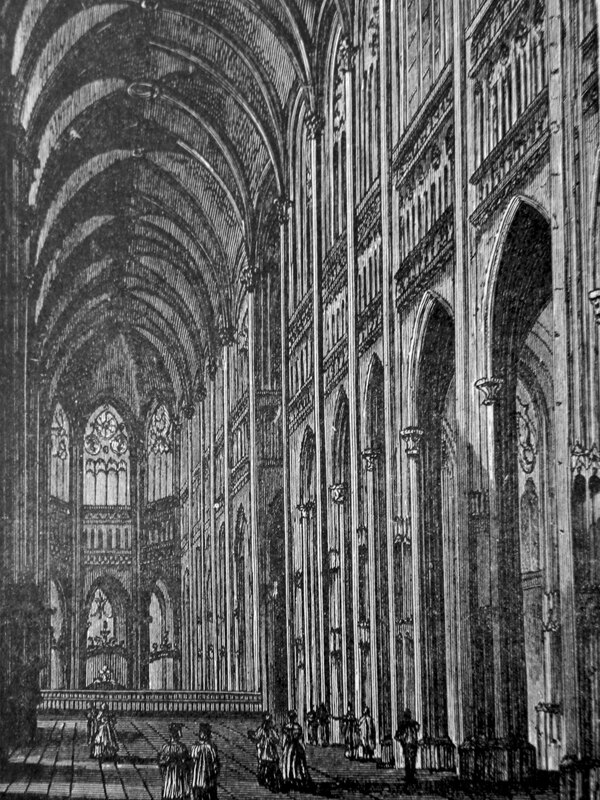 By the time it was completed, Gothic cathedrals were under construction in England, Germany, as well as in France. The Gothic cathedrals are shaped like an enormous cross. They have long slender arches and narrow columns that rise to amazing heights. The windows and doors in the Gothic cathedrals are pointed upward towards heaven in the shape of praying hands. Also, the roofs of Gothic cathedrals are adorned with steeples and spires that jettison majestically towards heaven. 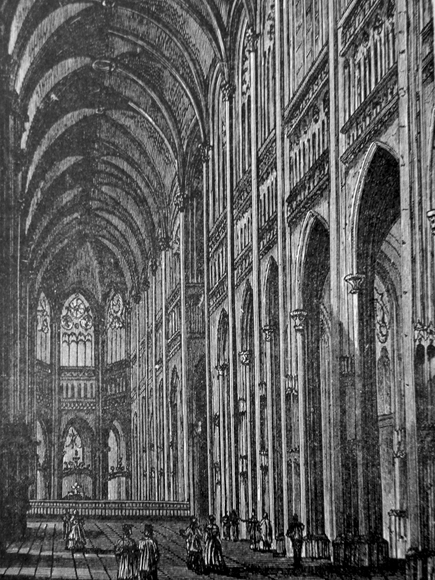 The walls of the Gothic cathedrals are supported by flying-buttresses that keep them from collapsing forward. They are also heavier and thicker than Romanesque walls. Gothic cathedrals emphasize openness and they have an amazing amount of windows that let fill the sanctuary with light. The windows are made of stained glass, and they usually depict a scene in the Bible. Each color has its own symbolic meaning. As time passed the competition for the highest cathedral intensified between the cities. The idea at the time was that the town with the highest cathedral would be the closest to God. The competition ended when the 157 foot high walls of a cathedral in Beauvais, France, collapsed in 1284. The construction of a town cathedral was usually a huge undertaking that required enormous amounts of labor, money, and sacrifice on the part of the Christian community. Cathedral construction often took between 50 and 100 years. At the same time thousands of laborers were needed to work on a project. Construction started with unskilled laborers digging the foundations and moving enormous stone blocks into place for the foundation. Much of the work was done by volunteers. However, highly paid skilled masons were also needed to cut stones so they could fit perfectly in place. Becoming a mason required a seven year apprenticeship. In addition to the masons, great numbers of artists were utilized to create the art work for the sanctuary. This included the stain glass windows, statuary, carved stone patterns, and wood carvings. In all of Europe, over 500 Gothic cathedrals were constructed, and the vast majority of them are still in existence today. Almost all of them contain some type of important religious relic. Many of the cathedrals that are no longer in existence were destroyed by war or fire. All of the cathedrals that are still in existence are a source of pride within their respective communities and are still being used for meeting places, church services, and pilgrimages.